Is about to bite the dust. (There isn't enough left to complete a row) After this, it's time to start the final skein. All but one end (the cast on end) is woven in, and its looking good. It should be finished some time tomorrow—maybe by then, I'll have unearthed the DK yarns that I have in a similar color way--I'll take a photo of the yarn, when I do find it. Oh wait--it will be completed (the knitting) but not finished. 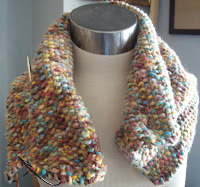 This scarf will need 3 special buttons--so it won't be finished--just yet. I'll have to find buttons to finish it! It's been fun this past month or two knitting up odd and ends and odd balls of yarn. It's gotten the creative juices flowing--(and made room for new yarns!) --not that I plan to buy any. But it is more room to put away some of the other odd balls, and handling them is bound to lead to knitting them up! I am continuing to try to make sense and order of my files, to find,, edit and organize a bunch of patterns—and to work on new ones. And I've been organizing (and coding) information for a bigger and better digital presence.